CaspianEventide aka CaspianEventide is a 26 year old (DOB: March 13, 1993) half-blood wizard living in In a cottage by the lake. He wields a 12¼" Cypress, Demiguise Hair wand, and is a member of the unsorted masses of Hogwarts students just off the train eagerly crowding around the Sorting Hat. His favorite Harry Potter book is Harry Potter and the Goblet of Fire and his favorite Harry Potter character is Cedric. Caspian was once a Captain of a grand sailing vessel that sailed the seven seas. His life was moving from port to port... until pirates attacked. They killed his crew and hit him over the head. When he awoke... he forgot everything. The captain of the pirate vessel decided to keep him and teach him all he knew. You see, he wanted to retire and this was his oportunity to do so. Caspian learned all there was to know about pirate life and took to it like magic. For years he was the scourge of the world's oceans... until one day, his memory returned. Now, challenged with his memories and his place in life... he felt torn and unsure of what to do. He left his ship and took out on foot.. deciding to be a wanderer until such time as he knew his place in the world. Remembering his life, he set out for his homeland, passing through many foreign lands, until he returned home to England and beyond that... Hogwarts. Knowing he needed to relearn everything, he signed up for classes once more. While living at Hogwarts, Caspian met Nimue and felt a connection at once. He knew there was something special about her. One night, the two met and his world changed forever. Nimue shifted to her Werewolf form and something inside Caspian gave himself to her. She bit him and soon after, Caspian shifted into a full Werewolf. Caspian is just over six foot tall with a strong athletic build. He has red hair with white streaks in it... red facial hair... and one blue eye. 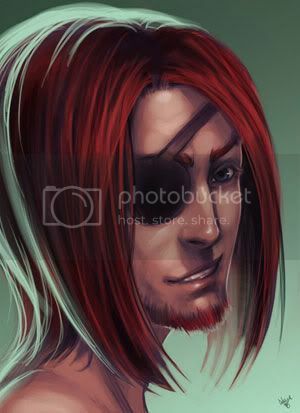 Covering the other eye is a black eyepatch. Caspian is a Werewolf and in his shifted form, he stands at about seven and a half feet tall and has a much more powerful form. He weights close to 250 pounds of pure muscle and is covered from head to toe in red fur with a white streak running through it. In this form, his eye grows back and both eyes are a warm amber color.